As a student of pop culture, I try to be familiar with the latest trends in music. However, I understand that I am out of the demographic for many of the new songs and artists. That doesn't stop me from analyzing lyrics from recent hits. Enjoy! How exactly do you quantify this? Is Izzy really realer than say Steelers WR Antonio Brown? How is business going? Is there a substantial murder business for Australian-born female rappers? How exactly would we know this? There's a fast lane from LA to Tokyo? Even the fast lane would take a really long time. Maybe she travels by map. Mom, really said that last line? That's quite the open relationship between a mother and daughter. Maybe it is a female thing. When my male sons are grown, I can't picture having this kind of discussion with them. What the heck does bang bang all over you mean? Actually, I don't want to know. She might’ve let you hold her hand in school, but I’mma show you how to graduate. To graduate, make sure you study so you get passing grades on tests. In addition, do not violate the attendance policy. Done. This concludes another edition of Sean analyzing song lyrics. Click here for previous editions. Scientific might be a bit much, but how about a sociological study. There are 6 questions below. Please answer how this best describes you. a. Toilet paper goes over the top. b. Toilet paper comes from under the roll. c. Never thought about it. 3. Do you have a specific way/plan of loading the dishwasher (ex. Forks and knives down or plates all in the same direction)? c. You have a dishwasher? 4. Do you own a Smartphone? 5. What tastes better: green grapes or purple grapes? 6. How long do you keep general bills/statements (such as electric, phone, credit card bills/statements)? Please leave your answers in the comments section below. There are no wrong answers here. Well, maybe one or two wrong answers, but this is a scientific study, so no judging. Don't forget that you can like & follow Sean's Ramblings on Facebook. I haven't written about any of my experiences being a soccer referee lately since nothing truly exciting or out of the ordinary has occurred. More importantly, I went on a self-imposed sabbatical from working as a ref (see the raising two young kids thing). While I worked as an assistant referee (AR) for one adult game in July, this past weekend was the first time I worked multiple games in probably 9-10 months. I served as a referee for a tournament and was assigned 3 high school aged boys games. Again, nothing out of the ordinary except for trying to see what kind of shape I'm in...until this happened. That is my cleat. It is not supposed to be in two pieces. I worked as an AR for the first game and moved to the center referee position for game #2. About 5 minutes into this game, the top portion of the bottom part of my cleat came undone. 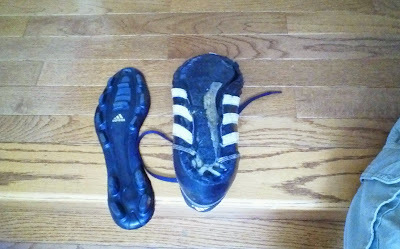 Fortunately, the entre bottom part of my cleat came off (though exploded sounds more exciting) about a minute later. I have no idea how I would have run the entire game with part of my shoe flapping around. It took another four minutes to retrieve the missing part of the shoe, and I ran around holding the shoe for another minute until I could get it off the field. There's a specific uniform you have as a ref that includes black shoes. While I knew that it was probably about time to get new cleats, I didn't think about bringing an extra pair of black shoes since, first I don't have a second pair of cleats, and second, I never thought that my shoe would explode! So I ended up finishing the entire game running on essentially one and a half shoes, and in my opinion, called a good game. For the third game, I wore gray tennis shoes as an AR. I don't think anyone noticed though I know I probably looked a little silly. Oh, it turns out that I fared pretty well keeping up with all of the 16 & 17 year olds. Of course, I was exhausted when I got home from the games and am a little sore today. Earlier this week, it was announced that "Charles Wang has an agreement in place to eventually transfer ownership of the New York Islanders to a group led by former Washington Capitals co-owner Jon Ledecky." Apparently, due entirely to the last name of the Islanders' owner, I started thinking about the band Wang Chung. Then, I remembered the band's appearance on the (unfortunately) short-live NBC show Hit Me Baby One More Time. Enjoy Wang Chung performing their signature hit as well as their cover of Nelly's Hot In Herre. So on this Friday, celebrate like Frasier. Former Pittsburgh Mayor Sophie Masloff died on Sunday at the age of 96. Masloff was already an "old Jewish grandmother" when she took office in 1988 after the passing of Mayor Richard Caliguiri. While you can read about Masloff in the Pittsburgh Post-Gazette, I wanted to write about her appearance on the short-lived Pat Sajak show. The Pittsburgh mayor going to Los Angeles to be on a national talk show was a big deal. Politicians, particularly Presidential candidates, go on TV shows regularly now, but the hometown mayor traveling 2000+ miles in 1989 seemed unprecedented. This was way before the days of Tivo and the DVR, and I don't recall if my parents let me stay awake to see Masloff on the Sajak show (it was a school night!) or if they woke me up to see her, but I remember watching her appearance. Again, this was a big deal. I was too young to know if Sajak was using Masloff as a gimmick, but it seemed like she came off positively. While I thought Masloff presented Sajak with a Mario Lemieux jersey, according to the Monessen Valley Independent, she simply gave him a Pittsburgh Penguins T-shirt. Unfortunately, I could find little about her appearance online. Apparently, there is not a robust archives of the Pat Sajak Show archives. There seems to be no video (with the exception of two seconds in the WTAE video below) or pictures of Masloff on Sajak . There is also a 1989 P-G opinion piece about Masloff going on The Pat Sajak Show. Masloff will certainly be missed. P.S. I feel the need to share that I'm in a fantasy football league named after Sophie Masloff. Thanks to DLuvPGH for helping me search for information about Masloff-Sajak. * I took both boys out by myself for the first time last weekend to see a music performance that was supposed to be geared for kids but wasn't very good. Anyway, my goal was to leave the house at 9:15. We left at 9:40. * Ohio State is playing against Navy in Baltimore and then 5-6 weeks later at The University of Maryland in College Park. That was poor planning on someone's part (I'll blame the Big 10). More importantly, why didn't I know about this? As a graduate of The Ohio State University, shouldn't the alumni organization let me know about this? Do they not consider Northern Virginia part of the Maryland-DC region? Of course, I'm not a member of the alumni organization, so, um, I'll blame the Big 10. * Our home uses gas for heat and electric for air conditioning. Therefore, our gas bills are low in the summer bit higher in the winter. Actually, the fact that our summer gas bill is generally $20-$30 is a bit of a joke since (to my knowledge) the gas is never on. Anyway, this month's bill is $0.81. I approve! When I tried to pay the $0.81 through my online checking account, the bank denied my payment requiring me to enter an amount of $1 or more. Look out for that $0.19 credit next month! * I just finished reading Brazil's Dance With the Devil: The World Cup, The Olympics and The Fight For Democracy by Dave Zirin. Very, very interesting read. Based on the book, I never want the Olympics in DC, Pittsburgh, or basically any American city. * I cut myself fairly badly while shaving over two consecutive days this week. You would that that I would be able to avoid this after shaving for 25 years. * Remember a few months ago when I nicknamed my new son Pedro Tulowitzki after two members of my rotisserie/fantasy baseball team? Well, Troy Tulowitzki is now out for the season and Pedro Alvarez barely plays anymore. Why Does Delaware Hate Pitt? Last week, an unscientific survey of Reddit users revealed the most hated college football teams by state. Naturally, The Ohio State University is the most hated college football team in Michigan, the University of Michigan is the most hated college football team in Ohio, Kansas University is the most hated college football team in Missouri, the University of Missouri is the most hated college football team in Kansas, and, um, the University of Maryland is the most hated college football team in Vermont. While it makes complete sense that the University of Pittsburgh is the most hated college football team in West Virginia based on the Backyard Brawl rivalry between Pitt and WVU, I don't understand the hatred of Pitt by Delawareans. Did Mike Ditka or Tony Dorsett slight Joe Biden? Are Delawareans upset that Pitt allowed Joe Flacco to transfer from Pitt to the University of Delaware? Did other Pitt fans complain about Delaware on blogs like this guy? Looking at the raw data (who is the one person that voted Middle Tennessee State as the most hated college football team? ), only 18 Delaware residents responded to this survey, so this is a small sample size. HOWEVER, I'm sure that these 18 people represent all Delawareans! If you can't see the map very well, here are the full state by state results. In another case of me getting old, I heard Shine by Collective Soul played yesterday on a classic rock radio station. When I listen to classic rock, I expect to hear The Beatles, Stones and AC/DC. However, Shine is now incredibly 20 years old, so I guess that qualifies as classic rock. Sigh. Still a great song though. If you have young children, you may be familiar with Jim Henson's Dinosaur Train on PBS. Just having the Jim Henson name attached gives this cartoon (and anything else) some credibility. Before I go into my thoughts about my son's current favorite show (which I think you'll enjoy even if you've never heard of Dinosaur Train), here's a description from the PBS website. Dinosaur Train begins when Buddy [a Tyrannosaurus Rex] is adopted by Mr. and Mrs. Pteranodon and brought to their nest to hatch at the same time as his new siblings, Tiny, Shiny and Don. Buddy and his new family have an insatiable desire to learn all about the different types of dinosaurs, so they board the wondrous Dinosaur Train, which allows them to travel and explore the world inhabited by these amazing creatures. Where to start? Well, combining dinosaurs and trains is a brilliant idea. These are two of many kids' favorite things. As for the Pteranodon family, Tiny is extremely outgoing, confident and talks to everyone. Buddy is also adventurous (though slightly less so than Tiny) and loves to state his hypotheses. Meanwhile, Shiny is high-maintenance and often self-centered, and Don may be the first animated special needs character on a kids' show. 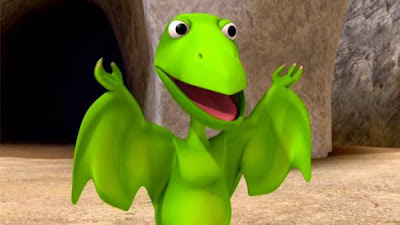 I applaud the Dinosaur Train creators for including such a character. Back to the show's premise, how exactly does a Tyrannosaurus Rex egg wind up in a Pteranodon nest? This is never explained, and there is no indication that there was an adoption process. There is actually an episode where Buddy learns that he's a T-Rex, and the T-Rex family offers to have Buddy live with them. He declines because the Pteranondons are his family now. Personally, I'd like to see the adoption paperwork since something seems sketchy. Donald Trump and others should focus on this rather than President Obama's birth certificate. Besides Mr. and Mrs. Pteranodon, the other main character is The Conductor, a Troodon that knows everything. Not explained is how through this vast dinosaur train network that travels throughout the Triassic, Jurassic and Cretaceous time periods, The Conductor drives every train. Doesn't he get a vacation? Aren't there other conductors who can take his various routes? At no point during the song is Mr. Pteranodon mentioned. He barely even makes the opening! Yet, many Dinosaur Train trips consist only of Mrs. Pteranodon, Buddy and Tiny meaning that Mr. Pteranodon is back caring for the two kids that require more supervision. - You may have noticed the dinosaur that roars at the end of the song. That is Laura the Giganotosaurus who appears to do little other than ride the train. Seriously, she is always on the train. - In most episodes, you'll see The Conductor punching the tickets of the Pteranodon family. I've always wondered about the ticket policies and procedures. It must be expensive to constantly ride the Dinosaur Train. Does the family get a special monthly/yearly pass? Are there discounted train ticket prices for the kids? Is it extra to ride the Dinosaur Train Submarine (which should just be called the Dinosaur Submarine)? - One of the characters that appears on multiple episodes is King Cryolophosaurus. (Yes, I had to look up the spelling...and name.) He's a dinosaur Elvis that is also scared of crowds. He can get annoying though some of his songs are pretty good. - The winner for most annoying character goes to The Conductor's Mom, Mrs. Conductor. She is a less attractive version of Fran Drescher. - I almost forgot to mention Dr. Scott, the paleontologist that appears in the middle of each episode to share some dinosaur knowledge. Whenever he comes on the screen, my son asks us to fast-forward. Dr. Scott is no Dr. Ross Geller! Overall, Dinosaur Train is a good kids show. I'm personally tired of Dinosaur Train now since my son seems to only want to watch that show. (Is it that much to ask for the show to produce a few new episodes?) However, I thought it was the greatest show ever when I first watched it, though that was probably because I couldn't take any more Thomas & Friends. Dinosaur Train does have some educational aspects, and it is interesting learning about all of the different types of dinosaurs. Now that you've made it through the end of this post, what do you think? Personally, I feel like this is either a masterpiece or the beginning of the end of my "career" as a blogger! Update: After publishing this, I found another Dinosaur Train post at LyzLenz.com. Amazing! She also mentioned something I've thought about many times. When are they going to show Buddy (or any other dinosaur) eating another dinosaur? Once Buddy gets older, his pteranodon may want to watch their backs! Pittsburgh Pirates third baseman Pedro Alvarez is struggling. Actually, that may be an understatement. Alvarez seems to have lost the ability to accurately throw the ball to first base. He leads the majors in errors and has been replaced by Josh Harrison. Meanwhile, Alvarez led the National League in home runs last season and is one of the best power hitters in baseball when he gets on a hot streak. However, he's not going to get on any type of hot streak since he's not actually playing other than an occasional pinch hitting appearance. Alvarez is out of options (meaning that he can't get sent down to the minor leagues), so the Pirates appear to be stuck. Pedro is a major defensive liability, yet, no one on the team can match his power. With the Pirates (likely) placing reigning NL MVP Andrew McCutchen on the disabled list, the team needs to find a way to get Pedro into the line-up. Since Harrison is now playing third, my solution is to start Pedro in right field. Yes, this may be crazy, but what are the other options? Let's start with why this won't work. 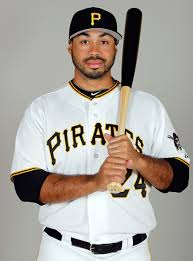 Pedro Alvarez has only played third base during his time with the Pirates, in the minor leagues and at Vanderbilt University. Maybe Alvarez played some outfield in high school, but to my knowledge, he did not. Teaching a player a new position in, oh, two days doesn't seem like a recipe for success. Plus, PNC Park requires athletic outfielders in both left field and center field. Alvarez is likely not athletic enough for either of these positions. With McCutchen going on the DL, Starling Marte can move to center. Do you move rookie Gregory Polanco to a brand new position to accommodate Alvarez? Now the alternative. The Pirates recently signed Jayson Nix who has already played in Philadelphia and Tampa this season. You can play him and move Harrison to OF along with Marte and Polanco. You can also keep Harrison at 3B and have Travis Snider or Jose Tabata as your regular outfielders. Regardless, a Pirates line-up without McCutchen and Alvarez is not intimidating and not one that you would expect to regularly score more than 3 runs per game. Alvarez has the ability to hit game-changing home runs and his on-base percentage has improved from last season. If you're looking for a similar situation, the Nationals moved Ryan Zimmerman to the outfield this season, a position he never played previously. That experiment seemed to go well until he got re-injured (which had nothing to do with the move to the outfield). Vote for Pedro (to play right field)!